Description: This sparrow-sized sandpiper has black legs and a relatively long, black bill which droops at the tip. Breeding plumage shows rufous on the crown, scapulars and ear coverts and chevron marks on the breast and sides. 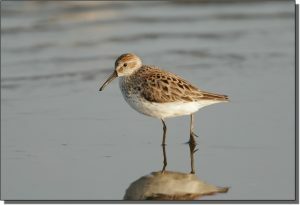 In nonbreeding plumage, adult Western Sandpipers are gray above with lightly streaked white breasts and white superciliums. Juveniles have rufous coloration on the scapulars. Similar Species: Western Sandpipers can be difficult to identify, especially in nonbreeding plumage. Their wingtips do not extend past the tail which eliminates Baird’s and White-rumped sandpipers. Unlike the Semipalmated Sandpiper, Western Sandpiper bills are longer and have a drooped tip. Be aware that the bills of male Western and female Semipalmated sandpipers can overlap in length. Western Sandpipers tend to probe more and are more often found in the water than Semipalmated Sandpipers. Comments: Western Sandpipers are often seen in large flocks. They primarily nest on the tundra of western Alaska and winter on beaches and mudflats along the coasts of the United States to northern Peru.